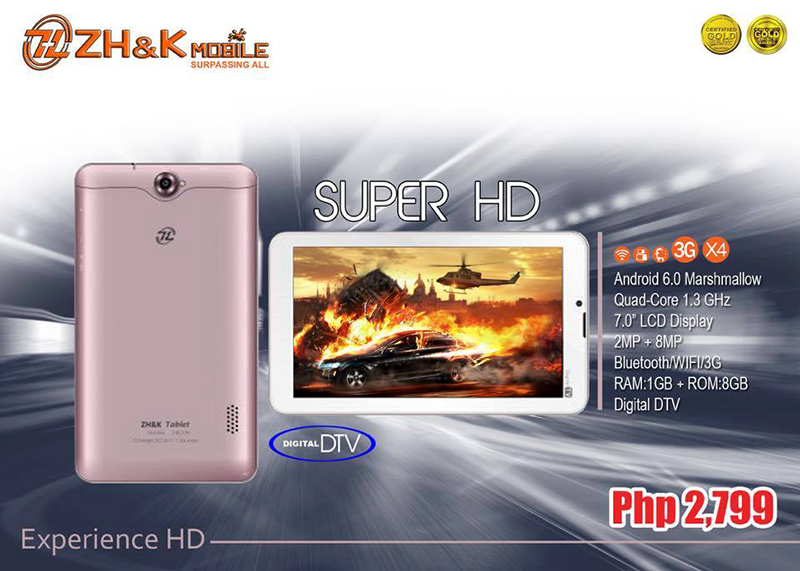 ZH&K Tablet Super HD With Digital TV Announced, Priced At PHP 2799! Home / mobile / news / zh&k / ZH&K Tablet Super HD With Digital TV Announced, Priced At PHP 2799! ZH&K, one of the makers of affordable mobile devices announced the Tablet Super HD. It's a 7 inch HD tablet with Digital TV support for your entertainment on the go. It's equipped with a kinda stylish body in rose gold color, unspecified 1.3 GHz quad core processor, ample 1 GB RAM, 8 GB of internal storage (not specified if expandable), 8 MP main camera, 2 MP selfie camera, WiFi, and 3G connectivity. It loads with Android 6.0 Marshmallow operating system that should be make this tablet have casual smoothness due to its 1 GB of RAM. Priced at just PHP 2,799, this appears to be a decent deal for a tablet with Digital TV capability. We'll update this post once we have the complete details.